In 2006, my freshman year at the University of Nigeria, a random adventure on campus led me to discover what many believe to be the forgotten transmitter of Radio Biafra, the crucial voice of the breakaway territory that was at the center of Nigeria’s brutal civil war 50 years ago. In May 1967, General Emeka Odumegwu-Ojukwu declared the southeast region of the country to be an independent republic. Radio Biafra’s broadcasts served as a medium of trusted news for citizens of the young nation, which featured news reports and war propaganda as Biafra battled Nigeria for its dear life. The secession of Biafra was Ojukwu’s response to mass killings of Nigeria’s ethnic Igbos in northern Nigeria, dating back to May 1953, when scores were killed in a pogrom that the government refused to investigate. Two coups occurred in 1966, the first one in January claimed the lives of many Northern military officers. 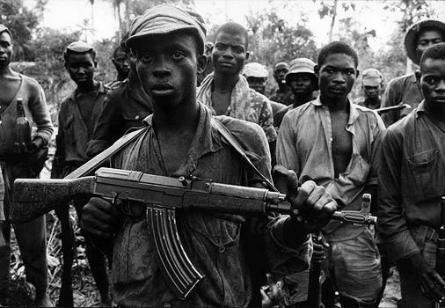 The second counter-coup left many Igbo military officials dead. On July 7, 50 years ago, the civil war between Nigeria and the breakaway state of Biafra officially began. By 1970 when the war came to an end, over 1 million Igbos had lost their lives. Nigeria’s fragile national unity was lost. I knew nothing about Biafra until I was 10 years old. What I learned was thanks to my family’s personal library and stories my mother told me of my maternal grandfather’s participation on the Nigerian side of the war. Millions of Nigerian citizens born years after the war know nothing about it or of the two coups preceding it. In our schools, there was no education about the civil war in the history curriculum; this is even more stunning considering the fact that the Biafran war captured international attention at the time. Last November, legislation to make history a core subject in our primary and secondary institutions was shot down in parliament for semantic reasons. We in Nigeria learn nothing because we have refused to address the past squarely and learn from it. Consequently, Nigeria is frequently repeating its mistakes, with tragic consequences for its people. Nigerian authorities have mastered the habit of ignoring the cries of marginalized groups or subtly fueling the maltreatment of their members, giving rise to public sympathy for demagogues who ultimately resort to violence to gain optimum attention for their grievances. For example, 50 years after the civil war, the case of renewed Biafran agitation is still being treated with kid gloves by Nigeria’s government. Many Igbos around the world still resent the dearth of proper federal infrastructure in the southeast and its political marginalization since the end of the war. This resentment has helped fuel the rise of Nnamdi Kanu, a frontline Igbo activist who has successfully resuscitated Radio Biafra and is agitating for the secession of the region. In detaining him for over a year on charges of treason before releasing him on bail, the Muhammadu Buhari administration unwittingly galvanized massive support for Kanu and his dubious ideology. To thousands in the southeast and an increasing number across the Niger, hopes for Biafra 2.0 are on the rise again. Kanu has effectively set the agenda for a fresh conversation on restructuring Nigeria, as statesmen and regional leaders are beginning to speak up to support fiscal federalism and a possible referendum on the independence of Biafra. Ever the opportunist, Kanu has called for a boycott of the governorship elections this November in the predominantly Igbo state of Anambra, unless a referendum on Biafra is called. In northeastern Nigeria, the early threat of Boko Haram also was at first ignored by successive Nigeria governments since the sect leaders Mohammed Yusuf and Abubakar Shekau began teaching radical ideologies to unemployed northerners. Shekau was killed extrajudicially in a Maiduguri police station in 2009. His death unleashed a terror that has ravaged the northeast of Nigeria ever since, with tens of thousands killed. Yet another example lies in Kaduna State. In December 2015 the Nigerian army killed scores of Shia Muslims who were followers of Ibrahim El-Zakzaky. Security forces also killed several of his sons. To this day he and his wife remain in state detention. Observers fear that while the more educated Shiites have yet to respond violently, there’s only so much they can take. A vicious reaction from them could cause a ripple effect of violence that could spur rounds of fighting in the already troubled northern region. Like the killing of Igbos in May 1953 that no one bothered to investigate, failing to pacify the Shiites could spell trouble in a few years — a counter-massacre or a full-blown Shiite vs. Sunni war. Nigeria as a nation exists on the basis of an ill-thought colonial decision in 1914, the terms of which may have to be renegotiated sooner or later, especially in the face of continued threats to national security posed by ethnoreligious conflicts. As a people, we need to discuss the feasibility of Nigeria continuing as one “indivisible” state. Otherwise, if we continue to ignore the lessons of history, we will keep the country locked in an endless cycle of tragedy that could one day lead to renewed civil war. Is this a risk that Africa’s most populous country can afford to take again? Eromo Egbejule is a Lagos-based journalist covering West Africa. He is working on a documentary about the civil war.